Commemorating 75 years since the Empress of Crime’s first book, the second volume in a set of omnibus editions presenting the complete run of 32 Inspector Alleyn mysteries. 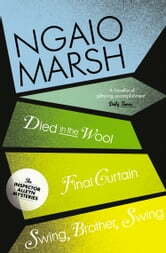 DIED IN THE WOOLOne summer evening in 1942 Flossie Rubrick, MP, one of the most formidable women in New Zealand, goes to her husband's wool shed to rehearse a patriotic speech - and disappears. 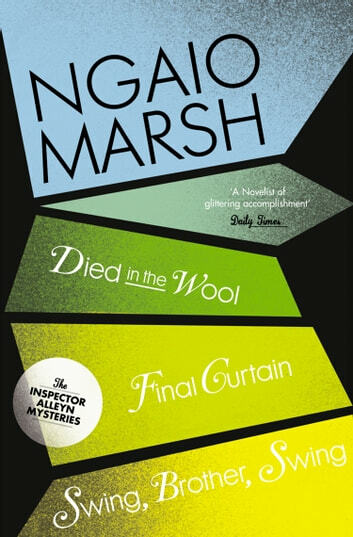 Three weeks later she turns up at an auction - packed inside one of her own bales of wool and very, very dead… FINAL CURTAINJust as Agatha Troy, the world famous painter, completes her portrait of Sir Henry Ancred, the Grand Old Man of the stage, the old actor dies. The dramatic circumstances of his death are such that Scotland Yard is called in - in the person of Troy's long-absent husband, Chief Detective Inspector Roderick Alleyn… SWING, BROTHER, SWINGThe music rises to a climax: Lord Pastern aims his revolver and fires. The figure in the spotlight falls - and the coup-de-théatre has become murder… Has the eccentric peer let hatred of his future son-in-law go too far? Or will a tangle of jealousies and blackmail reveal to Inspector Alleyn an altogether different murderer?